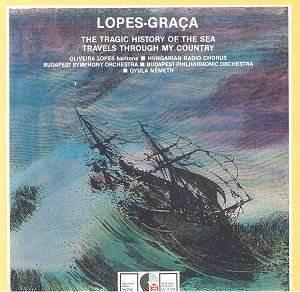 Lopes-Graça is one of Portugal's foremost 20th century composers. He was born in Tomar on 17 December 1906 and followed the usual pattern of piano lessons in his home town then formal music college education in Lisbon in 1924. There he studied amongst others with Luis de Freitas Branco and Jose Vianna da Motta. He also studied philosophy and history alongside his musical studies. From the earliest age he was active as a writer on music. Political affiliations denied him a professorship at the Lisbon Conservatory. Despite having later won a scholarship he was refused permission to go to study in Paris. This was again because of his political dissidence. Later under his own resources he went to Paris to study with Koechlin. While there he harmonised a series of Portuguese folksongs. The War drove him back to Portugal. There he indulged in every aspect of musical life especially in relation to new music. He was responsible for founding the Portuguese Section of the ISCM. 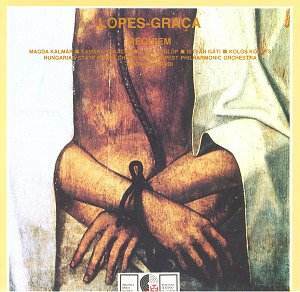 Two strands are apparent in his music: Portuguese folksong and an affinity for its musical elements (harmony, melody and rhythm) and Stravinskian neo-classicism (with splashes of de Falla and Bartók). This is the most generous of the quartet of discs under review. The Tragic History of the Sea is a song cycle with orchestra. Its classic lapping sea evocation provides a gently rocking backdrop (compare the opening of Bax's Tintagel) before adding a choral contribution not dissimilar to the choir in Debussy's Sirènes and Janis Ivanovs' 4th Symphony. The baritone solo is more recitative than ballad - descriptive rather than first person immediate. The soundworld reminded me of de Falla's Atlantida and of Brucknerian horn calls. 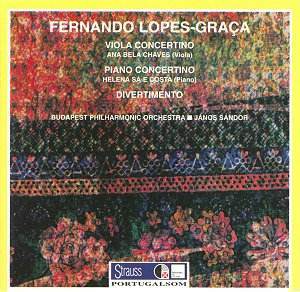 In later movements we are treated to catchy themes recalling Braga Santos's Symphony No. 4 decked out with mystical harp sweeps floating effortlessly up and down, a honeyed serenade to the accompaniment of dull thuds like distant breakers, bel canto, macabre bright Stravinskian trumpets; storm effects and a return to the rocking waves motif so familiar from Bax's Tintagel. The two Travels suites are bright and breezy folk suites with episodes taking in the ecclesiastical, an alcohol-enhanced sun-dazed afternoon, Moorish dances, guitars, raucous pipes and drums, a shade or two of the Berkeley/Britten Mont Juic dances, village festivities, the repose of a quiet city and gentle tambourine dances. All very attractive and undemanding though with enough invention to deliver surprises. The Viola Concertino is shorter than the similar work for cello. It spans many moods and episodes including a Moorish dance (with tambourine), Baroque trumpetry, a chanting songster and a roller coaster at full pelt - all packaged in a not very memorable shell. The style has references to Rawsthorne and the later Walton (cello concerto and Britten improvisation. The three movements are played without a break. The piano concertino is more engaging seemingly influenced by Milhaud's 1920s jazziness, Stravinskian outbursts and even the dynamism of the Shostakovich piano concerto No. 2. The piano part is clipped and catchy with quite a gradual stamping stride to it. There are stronger romantic elements in this work than in the viola companion. This coupled with rhythmically and elegantly accentuated energy makes for a most compelling work for anyone who enjoys the Shostakovich or Britten's piano concerto. Stravinsky is again a presence in the Divertimento. This is the jolly but stainless steel Stravinsky of Pulcinella and Dumbarton Oaks. A genuine smile comes through in the third movement. There are exotic breezes perfumed from Macao (we should never forget Portugal's colonial glories), some raucous antique dances, sly Mahlerian humour, an snowy eclogue, a powerful Petrushkan dance and finally not a little tenderness. The Concerto may well be familiar to those who bought EMI's Rostropovich Russian collection. It was written for the great Russian cellist and conductor. 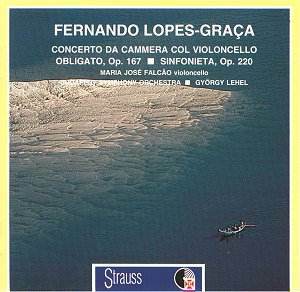 Lopes-Graca's leanings and the mastery of his music guaranteed him a prestigious Melodiya recording. The Concerto's passionately subdued tones take us deep into the glutinous clockwork of time. It has the tension of stormy tension of Rubbra's cello Soliloquy and of de Falla's El Amor Brujo. It has a subtle avant-garde fragrance recalling the cello concertos of Alan Rawsthorne and Gerard Schurmann. The Sinfonietta is lighter, as you might expect. It is still demanding touched as it is with a fruity neo-classicism but starved of strongly memorable thematic material. The one exception is the village folksong theme towards the end. This theme has the rise and fall of Braga Santos's thematic material. This is a late work of errantly meandering tonality. It is no more challenging than Schoenberg's Verklärte Nacht or Strauss's Metamorphosen. Its soaked textures will, especially in the massed choral and solo writing, remind you of Herbert Howells' Stabat Mater and, certainly of Britten's War Requiem. There are five movements: Introito, Dies Irae, Sanctus, Agnus Dei, Communio. The Introito is riddled with foreboding with optimistic lines rising out of the fog. The Dies Irae (the single largest movement at almost 20 minutes) is saw-toothed with violent assaults from the brass taking a leaf from Penderecki's book. Anger and resentment and Brucknerian jagged brass bark out step-down fanfares. The music seems to speak of the plate tectonics of great change; of those ground down and of those exalted. The prices are: UK pounds GBP6 and US dollars -10 (freight not included). Credit cards are accepted with the name of the buyer, credit card number, validity date and type of card.